The MPLAB SIM capability provides a simulator for the various Microchip microcontrollers. This document demonstrate the steps required to use the simulator. Setup the project as usual, as described in the MPLAB tutorial. Download: loops.zip for the project files used in this example. Before trying to execute the code, let's also open a Watch window and add the PORTD and TMR1 special-function regisiters to it. Click the Add SFR button. Press the simulator reset button on the toolbar or select Debugger -- Reset from the top menu. Now you may manually step through the program using the Step In or Step Over buttons of the debugger toolbar or the Debugger -- Step In and Debugger -- Step Over commands from the main menu. You may also use Animate option from the top-level Debugger menu or the Animate button from the dialog toolbar to choose the animation mode. 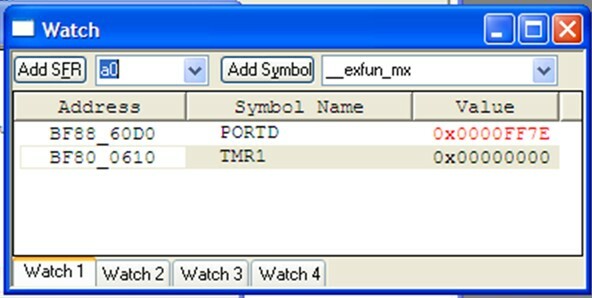 In this mode, the simulator executes one C program line at a time, pausing shortly after each line to give you time to observe the results in the Watch window. The speed of execution in Animate mode can be controlled with the Debugger -- Settings... dialog box, shown below. 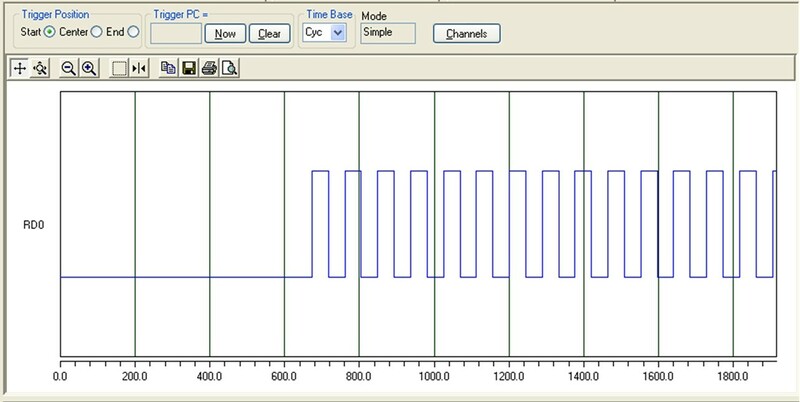 The MPLAB SIM Logic Analyzer gives you a graphical and extremely effective view of the recorded values for any number of the device output pins, but it requires a little care in the initial setup. Select the Debugger -- Settings... dialog box and then choose the Osc/Trace tab. In the Tracing options section, check the Trace All box. Now you can open the Analyzer window by selecting View -- Simulator Logic Analyzer from the top menu. Click the Channels button to bring up the channel selection dialog box. From here you can select the device output pins you would like to visualize. In our case, select RD0 and click Add =>. Click OK to close the selection dialog box. You can run the simulation by pressing the Run button on the Debugger toolbar , selecting the Debugger -- Run menu item, or pressing the F9 shortcut key. After a short while, press the Halt button on the Debugger toobar, or select the Debugger -- Halt menu item, or press the F5 shortcut key. 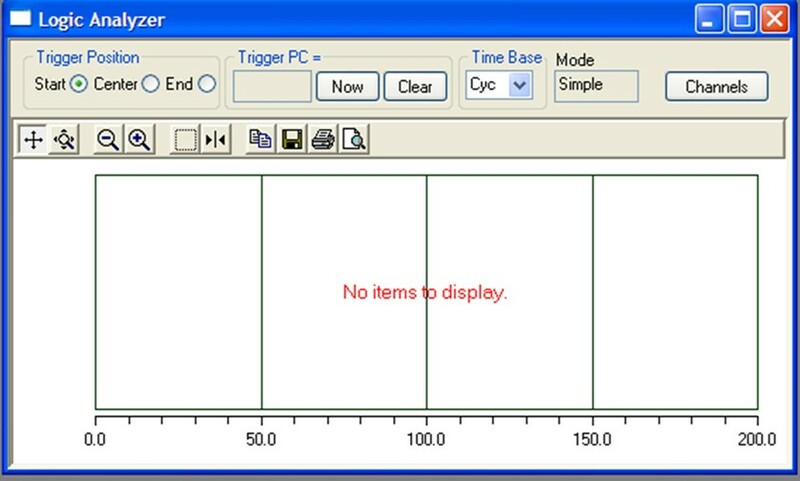 The logic analyzer should display its results (a square wave). In our case, you may get better results by pressing the Animate button on the Debugger toolbar, or select the Debugger -- Animate menu item. The logic analyzer will now update continuously, and you can stop the display whenever you have collected enough information. 05:  *  since the delay is so short. The logic analyzer window shows the pin RD0 switching on and off, once execution has entered the LED-flashing while loop. Lucio Di Jasio, Programming 32-bit Microcontrollers in C, Exploring the PIC32, Newnes (Elsevier), 2008. ISBN 978-0-7506-8709-5. Pages 12-14 discuss using the simulator. Pages 35-37 discuss using the logic analyzer.